Sweet baby Jesus these are without a doubt one of the BEST chocolate bars I have ever eaten!!! The only way I can describe them is as super caramel-y, chocolate-y marzipan-y goodness! Ugh they are actually UNREAL!!! I have been debating for the last week as to what to call them and I’ll be honest I still have no feckin idea!! So I’m just gonna go with a make-y up-y name in true Sweff The Chef style and call them Marzi- Mel Bars! Yep, that’s right I’m actually gonna call them that! Cause it’s the only way that I can get the words Marzipan and Caramel into a sentence with out it sounding super boring. So there you have it. Now let me introduce you properly to these little beauts! 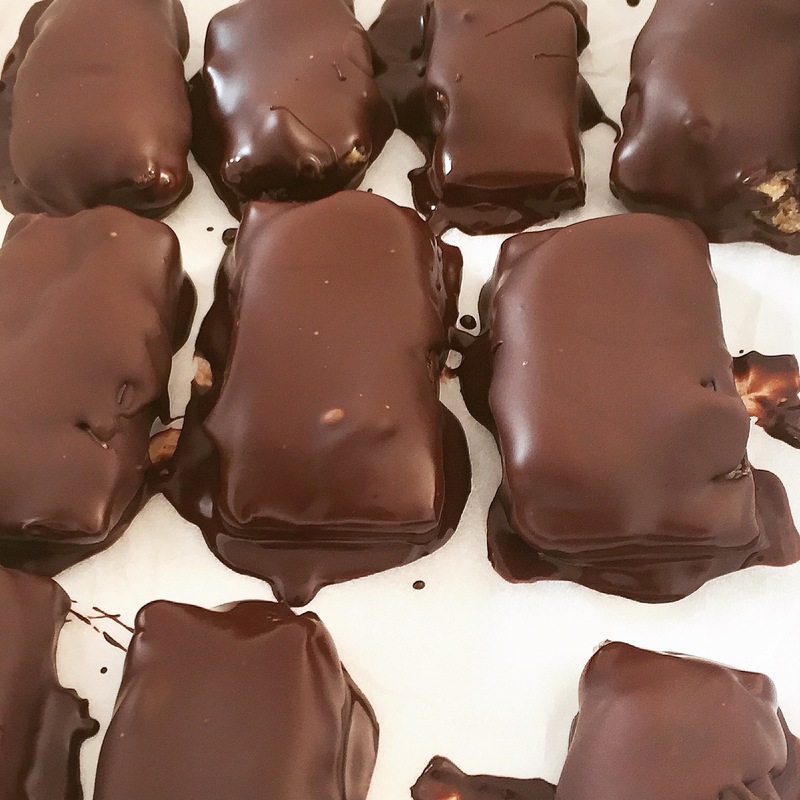 I created these little gems about three weeks ago when I was dying for some chocolate but couldn’t decide between making caramel or marzipan chocolate bars so I just said feck it! I was too tired to make both so I threw the whole lot in together and that was it. MarziMels were born! To say that these are addictive is an understatement. They are down right dangerous but oh so goddamn good! Looking at the nutritional profile of these little nuggets you would be surprised to know that whilst they are a treat and should be eaten and treated as a treat…… they’re actually not that bad for you?! How did that happen??!! 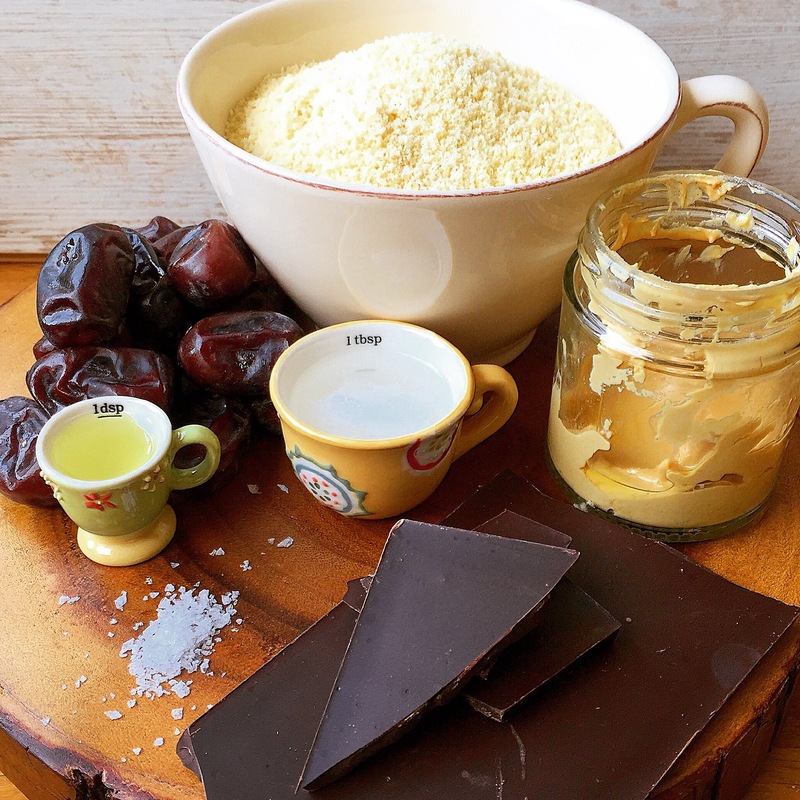 There are only a couple of ingredients and all are plant based so wohooo for us! Obviously if you use shop bought choccy they’re not gonna be as healthy but overall there is very little nasty’s, full of good fats, vitamins and minerals but pretty high in natural sugars! 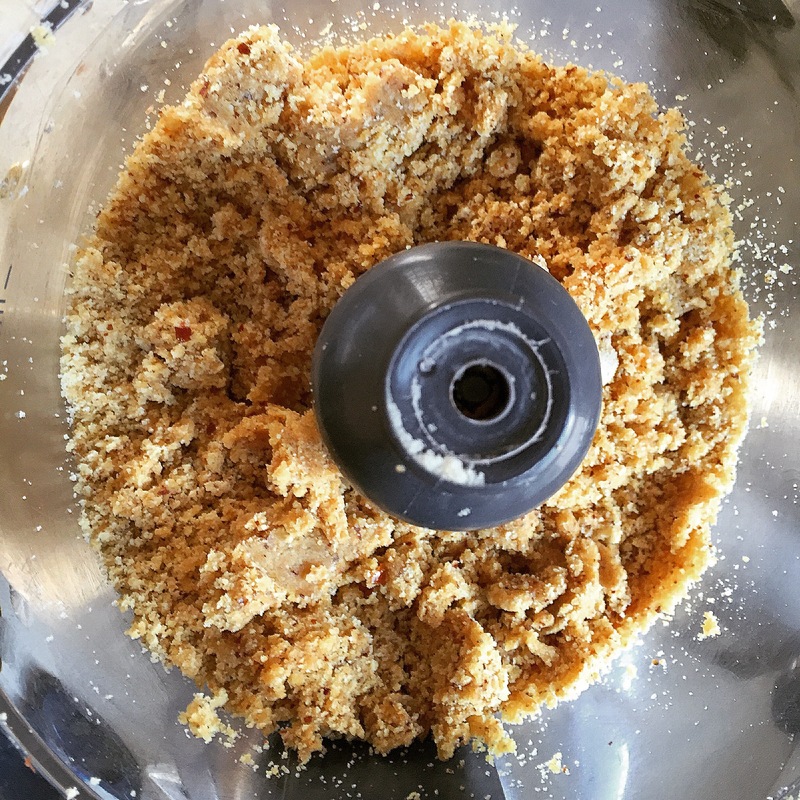 Throw the dates, ground almonds and almond essence into the food processor and blend on high until it looks like wet sand. 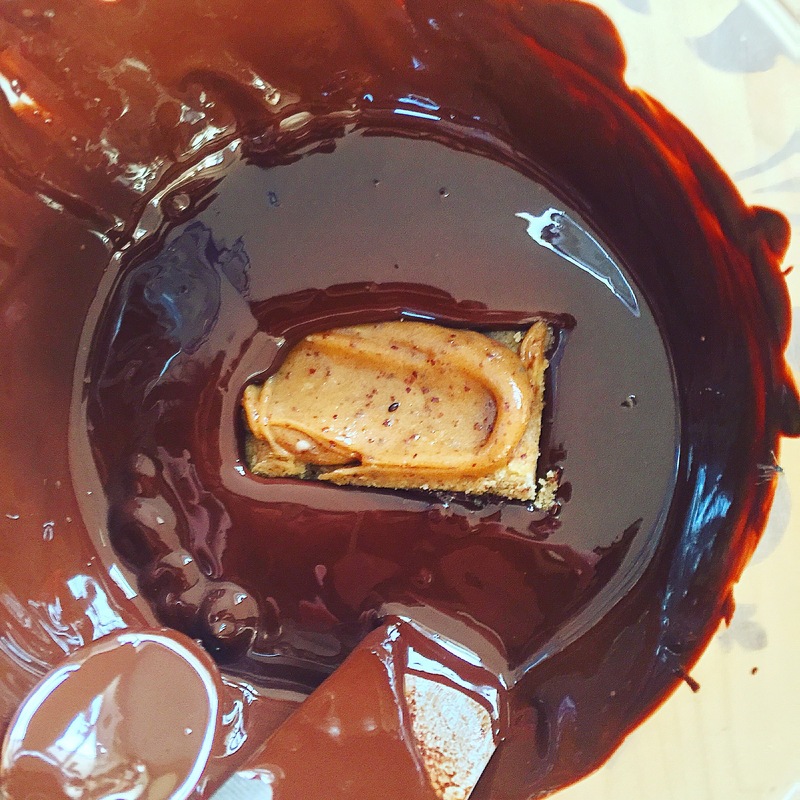 Pour the almond mixture into a parchment lined baking tray and push the mixture down as hard as you can so it creates a solid base, then pop the tray into the freezer to set whilst we get on to the yummy scrummy caramel!! Oh god I love this part…. Ok so grab the food processor again, no need to wash it! 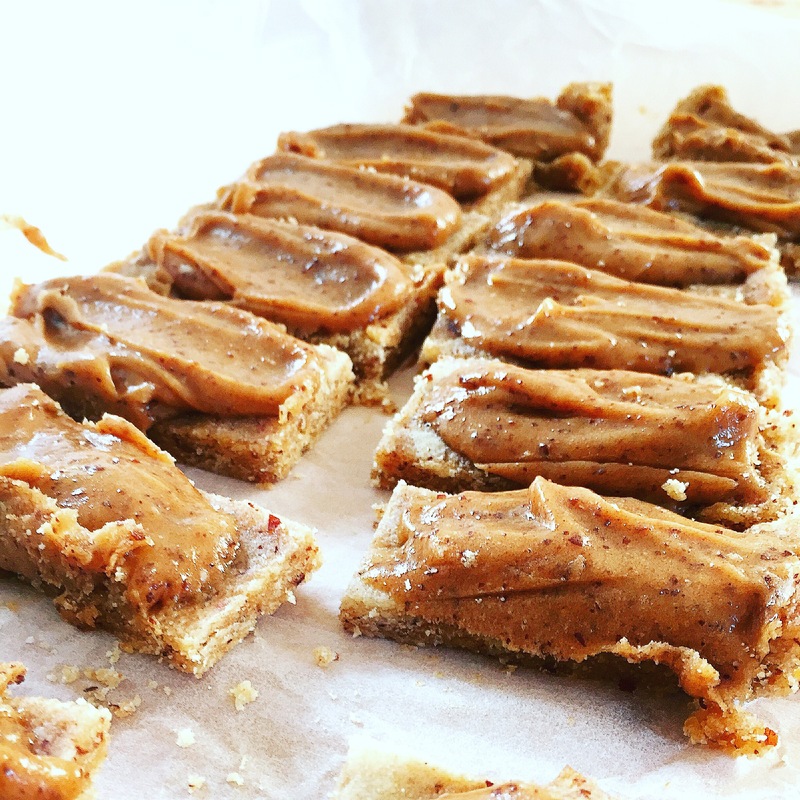 Any crumbs that are left over will only add the richness of this caramel. Did I mention that we’re gonna be making caramel yet? Cause we are! Its ok…. I’m super excited too! ….. 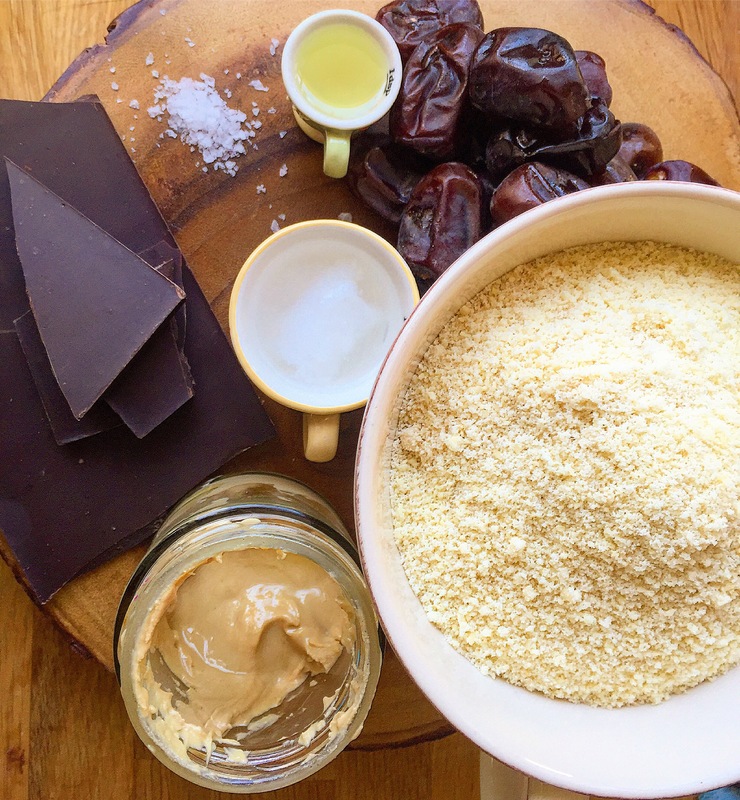 Right so pop the dates, cashew butter, almond essence, water, vanilla and coconut oil into the food processor and whiz on high! Oh baby! Get your spoon ready cause it tasting time! You’ve defo earned it! (PS this is unbelievable on top of ice cream or any type of dessert for that matter! Plus I haven’t met a kid or adult who didn’t like it even though its soooooooo much healthier and easier to make then regular caramel! Ok back to the recipe, take your base out of the freezer and cut with a knife into desired shaped bars. Next spoon the caramel mixture on to each bar and then pop the bars back in the freezer to set. 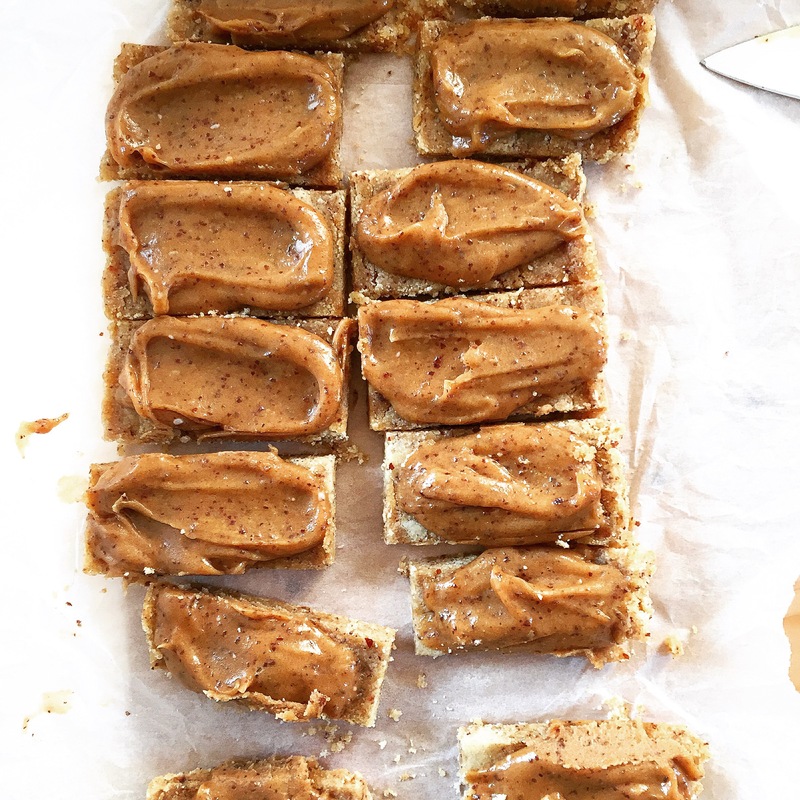 If there’s any caramel let over eat it with your fingers Nigella style or pop it into a jar and leave it in the fridge for another day….. yeah right! Last part, melt your choice of chocolate in a bowl and remove bars from the freezer. 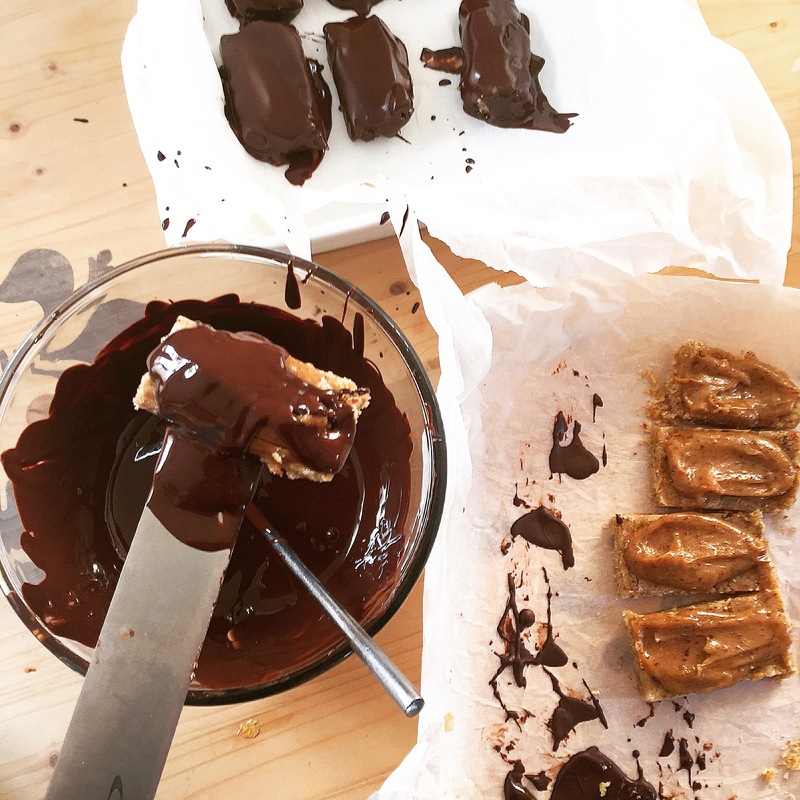 Pop each bar onto a knife or a spatula and dip into the chocolate, shake off the excess and then pop the bar back onto the parchment. The chocolate should set nearly instantly as the temperature of the bars would be quite cold from being in the freezer. And that’s it my lovelies, there you have it. The best thing since slice bread! They should last in the fridge for up to 2 weeks or 3 months in the freezer.